Location of Kaohsiung County in Taiwan. Kaohsiung County was a county in southern Taiwan between 1945 and 2010. The county capital was Fongshan City. Kaohsiung County was established on 6 December 1945 on the territory of Takao Prefecture (高雄州) shortly after the end of World War II. In the early years, Kaohsiung County consists of most territory of Takao Prefecture except the territory near cities of Takao (Kaohsiung) and Heitō (Pingtung). The county is subdivide into districts (區), which is reformed from Japanese districts (郡). The districts are divided into townships. On 16 August 1950, another division reform was implemented. 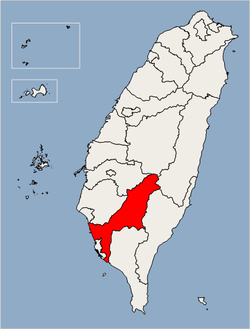 The southern part of the County was separated and established Pingtung County. The remaining Kaohsiung County has territory equivalent to the Hōzan (Fengshan), Okayama (Kangshan), and Kizan (Chishan) in the Japanese era. In addition, districts in the remaining part of Kaohsiung County was defunct. All townships were directly controlled by the County Government. On 25 December 2010, the county merged with Kaohsiung City to form a larger single special municipality. The subdivisions of the County remains mostly stable between 1950 and 2010. However, some changed has also been made. 1 Jul 1957, Maya Township (瑪雅鄉) was renamed Sanmin Township (三民鄉), Yani Township (雅爾鄉) was renamed Taoyuan Township (桃源鄉), Tona Township (多納鄉) was renamed Maolin Township (茂林鄉). 1 Jul 1972, Fengshan (鳳山鎮) reformed from an urban township to a county-controlled city for its population. 1 Jul 1979, Hsiaokang (小港鄉) merged into Kaohsiung City and reformed from a rural township to a district. 1 Jan 2008, Sanmin Township was renamed Namasia Township (那瑪夏鄉). Wikimedia Commons has media related to Kaohsiung County.